This is the newest entrant to the 2012 24 Hours at Le Mans, the pinnacle of endurance motor racing in the world. It doesn’t fly in case you were wondering if it did (it does look like the SR-71 on wheels). This is the Nissan DeltaWing. At this time, it is an experiment more than anything else but just look at it. The LMP1 class cars at Le Mans are already pretty radical but this DeltaWing makes those cars look like they were designed in a different era. The whole idea behind the DeltaWing is efficiency. As a result of several boffins putting their heads together, this design has reduced the weight (compared to similar racers) by 50%, decreased the drag by 50% and most importantly, has decreased the fuel consumption by 50%! What this means is you don’t need a crazy motor making insane amounts of horsepower to power the car to breakneck speeds. DeltaWing’s designers are hoping the fact that the engine, driver, and most of the mass are over the rear axle of the vehicle will work towards its maneuverability. The wheels only need to turn a small amount because they’re out at the end of this huge, rear-biased vehicle. The DeltaWing will be powered by a turbocharged, direct-injected 1.6-liter, four-cylinder with an output of around 300 horsepower. Known as DIG-T, the powerplant shares the same roots as the engine in the Nissan Juke. The Nissan DeltaWing will be racing in the “Garage 56” spot (which is reserved for futuristic racers), will wear Number 0, and won’t be classified in the results and as a result can’t win any trophies. Still, something tells us that all eyes will be on this bad boy on the 16th and 17th of June, 2012 at Le Mans. Update: The project is a collaboration between Highcroft Racing and ALMS founder Don Panoz and is built around the monocoque of last years Aston Martin AMR-One and at one stage could have been the future of Indy Car Racing. The fact that it has been built around the tub of the Aston means it had already passed the mandatory crash tests for the race. The #0 Highcroft Racing Delta Wing Nissan is driven by Marino Franchitti, Michael Krumm and Satoshi Motoyama. Krumm and Motoyama join because of their links with Nissan. Krumm has not driven here since 2005 and Moytoyama not since 1999. The car was set a target of lapping in 3 mins 45 secs by the ACO and got within 3 secs at the Test Day with probably more to come. The car managed 50 laps on one set of Michelin slicks at test day and is estimated to use about half the fuel of a conventional car. The design brain behind the car Briton Ben Bowlby said “It’s extremely difficult to have any certainty about finishing because every component is new. If I said we were going to finish then everone would say I was nuts”. 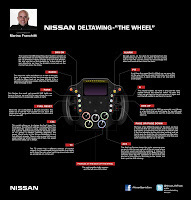 Update: In case you were wondering what the steering wheel looks like and how it works, check out the image below. Update (6/15/2012): The Nissan DeltaWing battled some minor technical problems during qualifying to record a time of 3:42.612 that places them 29th on the grid for the race tomorrow. 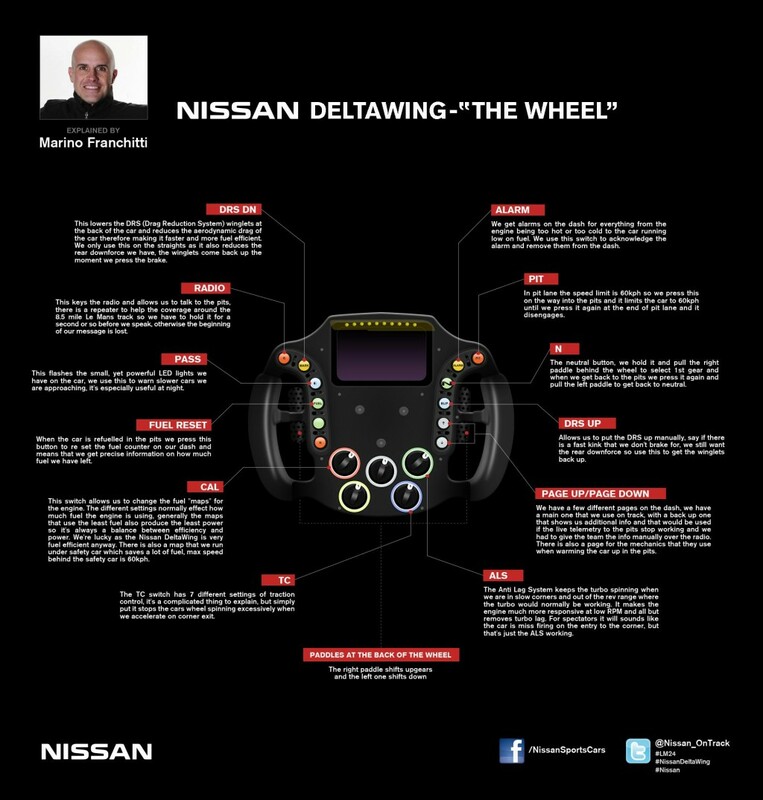 Update (6/24/2012): Here is a link with comprehensive information on the DeltaWing. BOND. JAMES BOND. THE OFFICIAL SKYFALL TRAILER.